TurnKey community development contest: let the judging begin! Welcome to the Ubuntu Weekly Newsletter, Issue 213 for the week September 26th - October 2nd, 2010. This survey consists of 10 questions. Please take a moment to give us your feedback. Thanks in advance. Some time ago a group of hyper-intelligent pan dimensional beings decided to finally answer the great question of Life, The Universe and Everything. To this end, a small band of these Debians built an incredibly powerful distribution, Ubuntu. After this great computer programme had run (a very quick 3 million minutes…or 6 years) the answer was announced. The Ultimate answer to Life, the Universe and Everything is…42, and in its’ purest form 101010. Which suggests that what you really need to know is ‘What was the Question?’. The great distribution kindly pointed out that what the problem really was that no-one knew the question. Accordingly, the distribution designed a set of successors, marked by a circle of friends…to ultimately bring Unity to all things living…Ubuntu 10.10, to find the question to the ultimate answer. And with that, the Ubuntu team is pleased to announce Ubuntu 10.10. Codenamed “Maverick Meerkat”, 10.10 continues Ubuntu’s proud tradition of integrating the latest and greatest open source technologies into a high-quality, easy-to-use Linux distribution. Ubuntu 10.10 will be supported for 18 months on desktops, netbooks, and servers. Mark Shuttleworth, founder of the Ubuntu Project, writes - I spent a lot of time observing our community, this release. For some reason I was curious to see how our teams work together, what the dynamic is, how they work and play together, how they celebrate and sadly, also how they mourn. So I spent a fair amount more time this cycle reading lists from various Ubuntu teams, reading minutes from governance meetings for our various councils, watching IRC channels without participating, just to get a finger on the pulse. He continues with - So I have a very big THANK YOU for everyone. This is our most valuable achievement: making Ubuntu a great place to get stuff done that has a positive impact on literally millions of people. Getting that right isn’t technical, but it’s hard and complex work. And that’s what makes the technical goodness flow. The Asia-Oceania RMB is undergoing restaffing. We are expanding to run two meetings to better accomodate our wide range of timezones. We require nominations for one position available for meetings at 9:00 UTC +-1hr and nominations for three positions available for meetings run at 1400 UTC +-1hr. If you wish to nominate someone, or yourself, send an email to ubuntu-membership-board-asia-oceania@lists.ubuntu.com. Try to explain your nomination. All nominations will be forwarded to the Community Council who will make the final decision. Applications will close 1-NOV-2010. If you require help or advice speak to a memeber of the board or your friendly Community Council members. Marcus and Ivanka sat Mark down for a few words of wisdom a few months ago and suggested the development of a brand new font for Ubuntu designed from the ground up. Mark writes about the progress made during the last few months, how you can get involved in the testing process and also how you can get font support for your language. As most of you who follow the Fridge know, Ubuntu has been given a face-lift. There is a cool new theme with new colors, a lighter feel, and just all around an upbeat tone to all the official Ubuntu related sites. Check out ubuntu.com and canonical.com to see the new look if you haven’t done so already. The goal was to have the redirect go live on Sunday 10.10.10 in conjunction with the release of Ubuntu 10.10. However, confirmation of this has not happened. However starting on Sunday, October 10th, we will be publishing Ubuntu News on The Fridge via ubuntu-news.org. In a slightly technical post suppliemented with a pretty graph, Julian Edwards has posted a very positive bit of developer news on the Launchpad Blog. Up until very recently the builders (machines that compile code for Ubuntu) could get blocked waiting for other packages to complete. Some optimisation has been done to improve the process and reduce blocking situations. Click through to see the pretty graphs and more detailed explaination. Robert Collins (Launchpad Technical Architect) has blogged about some changes which will affect beta testers of launchpad, the site used to manage much of the development of the Ubuntu project. In a change to the release process, beta testers should notice more rapid deployment of changes to the site, and fixes should be installable with less downtime. In a contentious (to some) move, the launchpad developers will be switching on 'automatic expiry' of 'incomplete' bug reports. This feature has been available to the launchpad developers, but has been switched off. It will be enabled during the week of the 18th October 2010. For developers who would like to use this feature on their launchpad projects, they will need to switch it on at a per-project level as outlined in this blog post from Deryck Hodge. Along with 10.10 here comes askubuntu.com. We’ve had a great beta where many experienced people participated and we had a nice standard of high quality answers and low noise. We’re experiencing a flood of new users and questions, so feel free to help out. Remember people love to vote on answers with screenshots and easy to use instructions. Go get em! We've still got one more blueprint coming: A Gesture Language. I haven't had a chance to compile my notes about this yet, but when I do, there will likely be another blog post just discussing the exploration we want to do around the idea of such a language at UDS. If you can't make it to UDS, remember that we broadcast live streaming audio and project IRC channels for each room up on a screen so that all present can read remote comments and respond to listeners' questions. Ubuntu is one of the most polished Linux distributions available, fusing the work of a global community of contributors who provide a diverse range of skills to make Ubuntu what it is. While we all enjoy the fruits of a new Ubuntu release every six months, many people have asked the team over the years how this wide range of contributors manage to come together to build a new Ubuntu release. Sean Michael Kerner from internetnews.com says that he really likes the new Ubuntu font, and will probably use it in all his Ubuntu-related writings. He also have concerns over the new font license, especially the one clause that would require any document written with it to conform its license. You read that right, Canonical will pay for you to experience the ease of Ubuntu Server on Amazon EC2 for an hour (well, approximately 55 minutes). We will take care of the registration, and setup and even give you some pre-configured applications to choose from (such as Wordpress and MoinMoin). We are that keen for you to see it for yourself. As part of the login process you will be asked to set up login and security credentials. But don’t worry, it’s really quick and easy. The Ubuntu community is invited to join the discussion and vote who should win $2400 in donated cash prizes. As a result of the contest nearly 30 new ready-to-use Ubuntu-based appliances will be added to the upcoming release of the TurnKey Virtual Appliance Library, covering an excellent range of high-quality open source software. "Looking at the big picture, what they've accomplished is not only a tribute to their own impressive abilities but also to the power of the open source ecosystem they leveraged. I can't think of any other area of human enterprise where a loosely knit band of individuals is empowered (in their spare time no less) to help enable thousands of individuals and organizations all over the world to take advantage of so much technological innovation." Ever since LugRadio decided to call it quits I’ve been hoping that some other high quality Linux and tech oriented podcast would appear to fill the void left in my podcast player. The Ubuntu UK podcast is quite good, but it lacks the rough edges of LugRadio. Many podcasts out there simply aren’t professional enough, so they are tedious to listen to, or they simply aren’t geeky enough. To be successful, a podcast need to be opinionated, well-informed and up-to-date. Lococast, announced in last week’s Ubuntu News Letter, seems to have what it takes. They describe themselves as a tech podcast with Ubuntu flair. This is the link to the Ubuntu Community Manager's (Jono Bacon) weekly videocast. Jono takes any and all questions from the community about all things Ubuntu and more. The board requested and received additional information from Scott Kitterman regarding his comment on this application. Cody Somerville motioned to postpone consideration. Colin Watson seconded the motion with the stipulation that a call for feedback from developers be made regarding this application. The vote was called and the motion was carried unanimously. Cody Somerville accepted an action to send an e-mail calling for feedback from developers on this application. ACTION: Cody Somerville to send an e-mail calling for feedback from developers on this application. Raphaël Pinson, a former Ubuntu core-developer, requested to be reinstated as a core developer. The Application Review Board proposed by Jono Bacon in https://lists.ubuntu.com/archives/technical-board/2010-September/000483.html was waved through informally, to bootstrap the application review process. We will re-evaluate in six months. It is not realistic to do any serious testing on these, since updates are released so fast; updates need to happen pretty much "blindly"
Our bug triage efforts are paying off for Xubuntu. Many bugs were squashed this past month. We tested Maverick Meerkat Beta with good results. We still need a good plymouth theme. We are attempting to submit new articles to Ubuntu Weekly News at least once a month about Xubuntu. 24 September - 1Help=1Coffee (http://ubuntu-ast.org/?q=es/node/75) & μCourses (http://ubuntu-ast.org/?q=es/node/73). Picture (http://farm5.static.flickr.com/4125/5041446489_47dbfd232b_z.jpg). 17 September - 1Help=1Coffee (http://ubuntu-ast.org/?q=es/node/75) & μCourses (http://ubuntu-ast.org/?q=es/node/73). Picture (http://farm5.static.flickr.com/4090/5041446481_1fbd5d94f3_z.jpg). 10 September - 1Help=1Coffee (http://ubuntu-ast.org/?q=es/node/75) & μCourses (http://ubuntu-ast.org/?q=es/node/73). Picture (http://farm5.static.flickr.com/4133/5041446493_d5835304fc_b.jpg). Software Freedom Day (http://www.meetup.com/ubuntuvancouver/calendar/14158729/?from=list&offset=0) event planned for Vancouver. Maverick Release parties planned for Vancouver, Kitchener-Waterloo, Ottawa and Toronto. September 28th: meeting with CTUG for next release party. bonjour Ubuntu (http://bonjourubuntu.fr) - New french website launched last month - Each day, one picture on Ubuntu and its awesome community. This is a multi-distribution small install fest where around 60 people come to get help configuring and installing their Linux system. From Saturday to Sunday evening stallholders set up shop along miles of streets. We have a booth at this event to present Ubuntu. Regular Monthly IRC Meeting (https://wiki.ubuntu.com/IrishTeam/IRCMeetings/2010-09-15) was held at 8pm Irish time on Wednesday 15th September. Members of our Loco did a great job of running OSSBarcamp (http://ossbarcamp.com/) on 25th and 26th of September in University College Dublin. On Wednesday 29th of September the Dublin (http://loco.ubuntu.com/events/team/345/detail/) and Cork (http://loco.ubuntu.com/events/team/347/detail/) Ubuntu Hours took place. Both will kicked off at 18:00 local time. We had a great Limerick Ubuntu Hour (http://loco.ubuntu.com/events/team/348/detail/) on the 30th of September at 6pm in the Absolute Hotel. 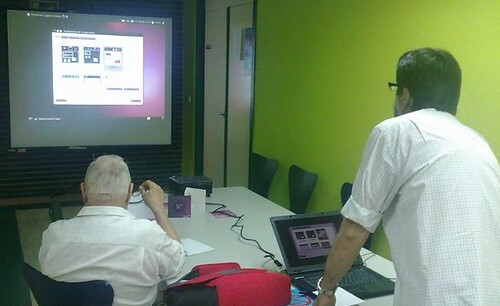 We helped spread the word of Open source software and ubuntu on the open source day in Israel. We had a booth on the biggest sci-fi convention in Israel, the Icon. 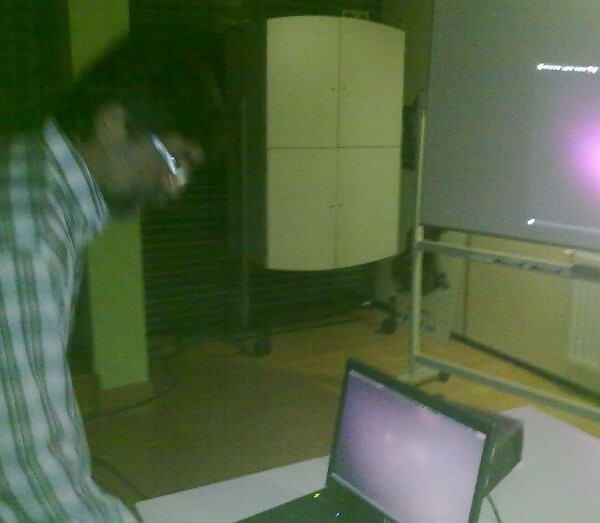 In this event we gave over 200 Ubuntu CDs, sold Ubunchu comics and earned 500₪ (about 100 Euro) of donations. We have started to push all the part of publishing Ubuntu, so we have printed Ubuntu fliers and Credit cards. for that we have also got a donation from "Hamkor" association for having a rollup for our booths. Ubuntu Magazine Japan vol.5 was released. We attended Open Source Conference 2010 Tokyo/Fall and held a seminar. Slides and Videos are available from the link below. The team member, Fumihito YOSHIDA, wrote the article about Btrfs in Ubuntu 10.10 for the October issue of Software Design. We replaced the archive servers (jp.archive.ubuntu.com and ubuntu-ashisuto.ubuntulinux.jp) with new ones. The team member, Nobuto MURATA, kicked off Ubuntu Hour Tachikawa-Tokyo. Cybernetisk Selskab (CYB) a student organization and IFI @ University of Oslo (UiO) held an installation party Monday September 13th at the main campus in Blindern. Bergen is planning an Installfest. This is arranged by BLUG (http://blug.kvidder.com/2010/arrangement/installfest-10-oktober-2010/) and Ubuntu enthusiasts. BLUG planning page here (http://www.blug.linux.no/wiki/Installfest). Oslo will held an event (http://www.350.org/work-party-oslo) in Humla @ Hausmania in coordination with the 10/10/10 intiative by 10:10 and 350.org. This in cooperation with Greenpeace, Critical Mass, Pimp-my-Bike, Norsk Klima Nettverk, Another Saturday Stellenbosch Ubuntu Hour (https://wiki.ubuntu.com/350.org), 10:10 Norge, Norwegian Red Cross and the avail from the Oslo City Council. Two organizational meetings with the other groups in September. September 8th: 1 member promoted to forum moderator, LoCo core team expanded. September 5th: Do too cope deadline, translation team expanded. Ubuntu Manual translation bumped on top. We plan, in association with Rakovica Municipality to publish 3500+ hard copies of Ubuntu manual and give them away to students in Rakovica elementary schools. September 17th: two hours server downtime, fixed. September 7th: 1st Monthly Team IRC Meeting was held in #ubuntu-us-fl. September 18th: Participated in Multiple SFD2010 events. September 18th: Ubuntu Hour Miami-Dade (http://www.ubuntu-fl.org/2010/09/19/ubuntu-hour-miami-dade/) was held. September 21st: 2nd Monthly Team IRC Meeting was held in #ubuntu-us-fl. Regular Monthly IRC Meeting (https://wiki.ubuntu.com/VirginiaTeam/MeetingMinutes) was held at 8pm Eastern on September 7, 2010.
https://wiki.ubuntu.com/Accessibility pages are being re-written. This is a work in-progress at this time. It will increase readability and insure the latest information is available to everyone. Regular monthly meeting on September 14, 2010 (https://wiki.ubuntu.com/BeginnersTeam/Meetings/20100914) - 8 members in attendance, 48 minutes long, with nhandler holding the chair.